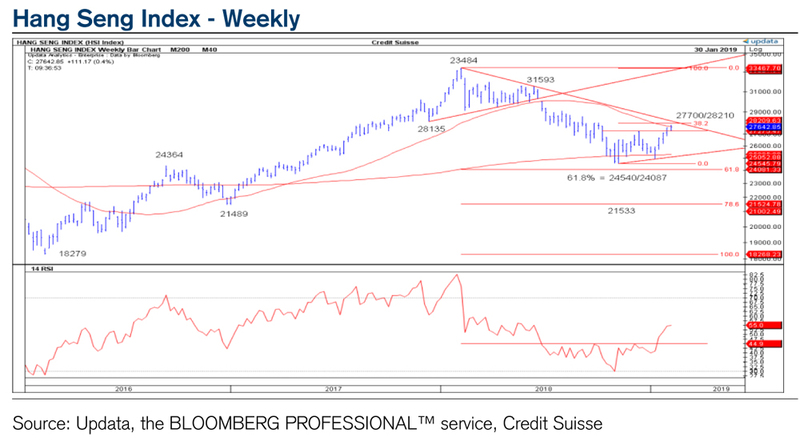 David Sneddon, Pascal Zingg and James Gilbert cite the completion of an ascending triangle base above the 27260 December range high and they believe the Index will now rise toward resistance at 27700/28210 (see Chart). This level, however, will present a major test since it is made up of i) the 200-day moving average, ii) the potential trendline down from the 2018 high, and iii) the 38.2% Fibonacci retracement of the 2018 decline. They say a close above this crucial 27700/28210 zone would add significant weight to their bullish bias. In wider terms, Sneddon and his team believe a bullish signal from the Hang Seng Index reinforces the bullish case for Emerging Market equities.